Wife, mother, grandmother, and retired human resources professional. What I do worry about is whether or not I have good gardening weather, the right fabric to quilt with, an interesting photo opportunity, and getting away as often as possible to our beaches, lakes and white mountains. 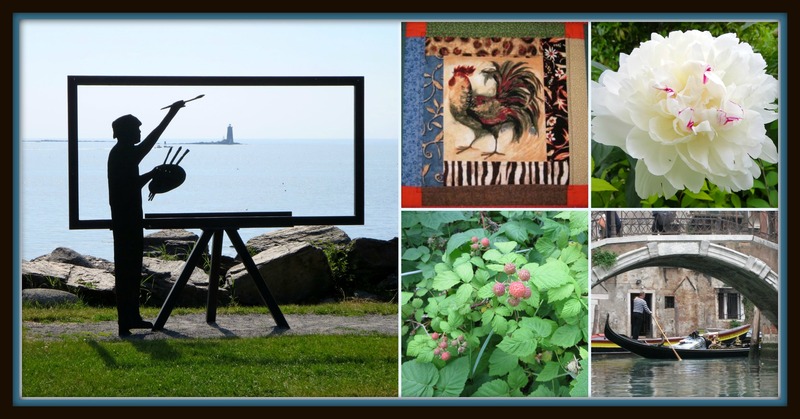 I am an Advanced Master Gardener with the University of New Hampshire Cooperative Extension, love to take day trips around the New England area, spend time with my two grandchildren, and journey to other interesting locations. Thanks for stopping by New England Garden And Thread. I normally publish two times a week on Monday, Wordless Wednesday or Thursday Doors. As most bloggers do, I look forward to and enjoy the exchange of comments. Welcome home, fellow gardener. What a lovely blog you have here. There is plenty here to like and learn. Thanks for stopping by my blog. Thanks for stopping by, and I’m with you about the watch. The days of the watch, Blackberry, pager and being on call 24/7 are over – well, unless we’re discussing grandkids. My husband’s the master gardener, and the cook. Lucky me. Have 2 awesome 7-yo grandchildren. May I suggest my Friday blogs for you and your grandson. I’m on a math jag now. Well, certainly you can and I’ll head right over and check it out. Thank you very much. Well, thank you very much. So kind of you to think of us. Thank you for liking my Wordless Wednesday post! You have a nice blog too! Great blog, glad I found it. My husband and I are also Master Gardeners here on Cape Cod. We are also into roses, we grow about 800+ in our yard. Our chickens amuse us as do our two grandsons who live here on the Cape (15 and 11) It’s pouring outside right now, maybe I will get something done in the house today – it’s been on the back burner! We used to have chickens in a tractor that my husband moved every day so different parts of the lawn would be fertilized with the chickens. We don’t have chickens any more, but we have green grass! The chickens mostly ate the bugs, not the grass. And, because the tractor was moved every day, there wasn’t time for them to scratch it up and kill it. In our area, if the chickens ate the ticks you could probably rent tractors out. We have a huge tick problem from CT on north. The chickens didn’t eat the ticks. I don’t know why. We bought guinea hens because they’re supposed to be really good against ticks. But, they weren’t good at protecting their young and tried to stay in the trees at night so we couldn’t protect them in a chicken coop. They were all dead in six months. Keeping the grass low seems to be the ticket for keeping the tick population down. Your blog is a breath of fresh air! Thank you for sharing! Enjoy the beauty and seasons of New Hampshire! Ironically, the New England area is the only area in the U.S. that I’ve not been to. (OK, haven’t gotten to Alaska either) However, always wanted to get over your way and hope you can point me to some great campgrounds. I miss volunteering as a Master Gardener. Unfortunately, I need to put food in my pie-hole also. I still help at the plant sales and with the 4H kiddies. I so envy your retirement status… I will return to volunteer as soon as I manage time. Would you believe you are the first ‘gardening’ blog I’m following? Truth! Welp.. See ya in the Reader! We’re not in Kansas anymore.. Enjoy your blog posts Judy. You’re in a lovely area of the world. I was actually wondering where in New England you are? I visited some friends over there a few years back, and toured around Peterborough, Keene, Concord in New Hampshire… That your area? No, afraid not. Just flew into Boston and then drove out west. Here is also one who is retired. Gardening in New England has to be challenging – unless you have a hot house. We remember it being brutally cold when we lived in West Lebanon, NH. When we had our house in Corpus Christi, TX I loved working with roses. Since we live in our RV and travel from spot to spot, it is not possible to ‘carry’ our garden with us. House plant gardening is not practical because Our cat loves our indoor plants. And yes, retirement is a major adjustment, just like marriage and having kids. It does require having a plan. I like the sound of you! i too love to garden, I knit, crochet and sew but don’t quilt though I just love quilts and the skill involved in them. My Mum used to quilt. We have travelled in your neck of the woods and loved it. We have 4 Grandkids who are the joy of our lives though we don’t see them often enough. I see we have a few things in common (including Dan’s blog!) and I’ve enjoyed scrolling through your posts. New Hampshire is a beautiful state to call home. I look forward to your photos and descriptions. I love your ‘about’. I just read it for the first time. Retirement is great, isn’t it? I’m 10 years old again, and playing and learning all the time! Thank you for stopping by my blog. That has brought me here today and I have enjoyed my browse through a few of your posts. We will probably travel through New England in the next few years. We have the kids getting out of college in a few years and then I retire – boom – we will be on the road. It will be a great time. Spent a whole summer in Concord, lived with my grandmother during this time. My memories of this time will forever be etched in my mind. New England is on my bucket list, especially in the fall when the leaves are dressed in their fall splendour. Getting my Master Gardener designation is also on my list. So many things to do, so little time! When I’m at home, during our summer months, I garden, quilt, and enjoy my neighbours. Seems like we have a little in common. I think I’ll enjoy following your blog. Happy to have found it. Judy, we are finally getting to New Hampshire — only for a day or two. But nevertheless, I’m so excited. We’re flying in to Boston and heading to Stowe, VT to stay a couple of days at Stoweflake Resort. May be able to spend night on coast — like Portsmouth or somewhere like that. If you have a recommendation, send it my way! Thanks! If you are passing through and only get one NH town, Portsmouth should be your stop. They have so many great restaurants and a couple of breweries, and you can park and walk the entire length of town while checking out the architecture, Prescott Park, and Strawberry Banke. Feel free to send me an email for further info on hotels, breakfast, beer. Thanks so much for visiting my blog, thereby inviting me to visit yours. I am not a master gardener, can’t quilt, am sugar-dependent, and I always wear a watch, but I feel very much at home in your blog. It’s very welcoming. I was amazed to spot the painter with the see-through canvas, because he’s also busy creating seascapes, no, riverscapes (is there such a term?) in Hamburg, Germany, where I live. Where did you spot him? That is amazing. 🙂 Sometimes it really is interesting to see the similarities in this global community. Thank you for sharing. I’m looking forward to seeing some beautiful quilts and gardens, Judy! Hi Judy, I enjoy reading about your gardening adventures and especially enjoy your Thursday Doors. Thank you for your comments on my blog but I’m unable to respond back by email. It looks like you’re set up as a noreply-comment blogger. I forget how to fix that but I had the instructions on my blog at one point. It may still be there. I don’t want you to think I’m a snob. Thanks for letting me know. I understand how technology sometimes throws us all a curveball and other times the road between the various blogging sites is not a smooth one. I admire your quilting skills and am always in awe of your projects. Your recent project reminded me of the fabric artist I mentioned on Thursday Doors. This blog feels like home. I look forward to following. I ❤ New England! am enjoying your blog! thank you! Thanks so much. We just recently decided to do this. Haven’t started planning yet, but this gives me some good information to begin mapping out a plan. We’re excited! It is a pleasure meeting you Judy. Isn’t retirement awesome. Every day we wake with joy of what the day will bring. So many interest to explore and things to learn. Its going to be great fun following along with you as we learn of the world through your eyes and words. Hello, I lived in New Hampshire for 11 years but recently moved back to Florida (yuk). I love New England and will enjoy reading your blog, even though the gardening info will most likely not be what I need! I am impressed by your Master Gardener status…! Thank you so much for checking out my new blog and liking some of my DIY’s. I recently moved to the country and am learning how to grow flowers and vegetables, so your blog will be helpful. I am also new to the WordPress community. I have a lot in common with you and was very inspired by your story. Thank you for your support.